Japan will host a slimline version of the Club World Championship in December 2005, according to Fifa. The eight-day tournament will feature the winners of the six continental club competitions, said world football's governing body. It will replace the Toyota Cup, a play-off between all the European and South American champions. The plan must wait for final approval at the Fifa Executive Committee meeting in London on 29 February. The proposal is for the European and South American champions to be seeded and to enter the competition at the semi-final stage. "They will each play only two matches within the space of a few days, a solution that will improve the balance in respect to the teams' long journey to and from Japan," said Fifa. 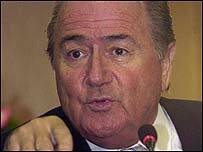 Fifa president Sepp Blatter said last month that he wanted up to 16 teams to play. But European clubs have been strongly opposed to the event's revival, arguing it would add too much to the workload of major clubs. Corinthians won the first Club World Championship in January 2000, beating fellow Brazilian club Vasco in Rio de Janeiro. The second edition was scheduled for Spain in 2001 but was cancelled following the collapse of Fifa's marketing partner, ISL.